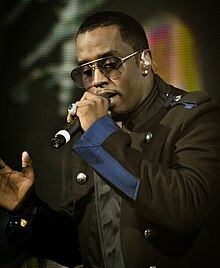 Sean John Combs (born November 4, 1969), an aa kent bi his stage names Puff Daddy, Puffy, Diddy, an P. Diddy, is an American rapper, record producer, entrepreneur an actor. ↑ "Sean Combs - Forbes". Forbes. 2015. Retrieved 28 April 2016. ↑ Greenburg, Zack O'Malley (May 5, 2015). "The Forbes Five: Hip-Hop's Wealthiest Artists 2015". Forbes. Retrieved June 27, 2015.